Beautiful, clean and spacious, the PRO Club has four pools - one each for lap swimming, family swimming, teaching, and deep-water activities. For your comfort, each pool is temperature-controlled (81-88ºF, depending on the pool). The pools are maintained with state-of-the-art UV purifying systems that keep the water crystal clear. Increase your strength and swimming skills with our aqua conditioning 10 pack. Valid for Aqua Conditioning only. Take your happy hour to the pool! 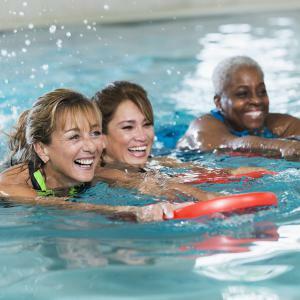 Strengthen your swimming skills in our adult-only lesson program. 4 lessons are redeemable Monday - Friday from 12-3pm only. Cost varies by duration. Be our guest! Try out our aquatics center with a set of four lessons. 4 lessons are redeemable Monday - Friday from 5am-3:30pm only. Cost varies by duration. For lap swimming 17 years of age and older. Home to our aquatic fitness classes and advanced swim lessons. Dedicated space for lesson instruction. PRO Club has a class for every skill level featuring the most qualified instructors. April encourages others and always sees the best in each person, which translates to positive, fun and uplifting swim lessons. Celebrating little victories is her driving force. April meets students at their level, being in the moment and recognizing each one's individual learning style when teaching. She has been leading children's groups in various settings, and has worked with a wide range of students from those who are fearful to those perfecting their technique. Cameron has been a swim instructor since 2013. He enjoys getting to know his students and discovering what excites and motivates them to become better swimmers. He mostly trains moderate to competitive swimmers, but has taught all levels from three-year-olds to teens. Cameron enjoys learning each child's personality and what makes them laugh and have fun in class. Carol is a lifelong swimmer who loves to support new swimmers in becoming comfortable and confident in the water. She has coached and taught swimmers at PRO since 2003, from toddlers to Master swimmers and Triathletes. Carol enjoys seeing her swimmers progress and succeed in their goals. Claire could swim before she could walk. She has always been in and around the water, starting with safety classes as a toddler in sunny Florida. Through high school and college, she swam competitively, was a life guard, and taught youth swim lessons and coached swimming. Claire works in the IT field by day, but her passion for Aquatics brought her to back to the sport she loves. Strengthening the fundamentals of swimming is at the core of Claire's teaching style for youth and adults alike. Daniel has been a swim instructor since 2007. He has taught H20 Cardio, Baby Aquatics, Group Youth, Group Adult, and Private swimming lessons. Daniel's instruction focuses on proper technique and adequate endurance. He's dedicated to making the learning experience enjoyable yet productive. Daniel is passionate about helping his students meet their personal swimming aspirations. Tell him your goal and he'll help you achieve it. Danielle enjoys working with clients of all abilities, backgrounds, and ages, from babies/parent-tot to adults. She’s extremely knowledgeable in specific skill development and fine-tuning a swimmer’s technique. Danielle has been teaching swim lessons since 2002 and was recently certified in GlideFit. She has extensive background in working with neurodiverse children and is extremely passionate about water therapy. She also works with those who have physical challenges or behavioral issues. Eric has taught swimming over 20 years and has worked with all ages. Being a triathlete who competes in sprints to Ironman competitions, Eric enjoys working with swimmers to achieve their triathlon swimming goals. He also enjoys teaching beginners and seeing the joy a person gets in learning new skills. Gigi has been in the fitness industry since 2008 as a group fitness instructor, personal trainer and swim instructor. She enjoys helping people become mentally and physically strong. Her workouts are fun, challenging and rewarding. Jamie has worked in Aquatics for over 35 years. He has taught swimming to all levels and ages, and he particularly enjoys working with fearful or beginning adult swimmers. In addition to being a swim instructor trainer and a lifeguard instructor, he has taught and coached a variety of other sports. Jamie is a Bellevue native who enjoys golf, skiing, sailing, canoeing and other outdoor activities. He brings a variety of teaching strategies and styles and believes in student-centered teaching. Janet enjoys working with all ages, from 6 months to adults, and has been teaching over 38 years. She has taught everything water-related, including Baby Aquatics, youth swimming, pre-comp and competitive athletes as well as triathletes. Her joy in teaching comes from seeing the love of the sport take shape and her students’ abilities to develop beyond their expectations. JJ began swimming competitively when he was 5 years old and continued to compete throughout high school. He also played water polo for eight years. He has coached Summer League swim teams and water polo to various levels, from children to high school athletes. JJ is a quiet, calm teacher who works on developing specific techniques, often focusing on individual skills until they achieve perfection. He believes in using a lot of drills to help his students break down their strokes and improve all around. Jesus has worked with and taught children in many capacities and at many levels. He enjoys teaching babies and children for the joy they bring. His passion for teaching comes from seeing children light up as they learn new skills. His teaching style and attitude are energetic and encouraging. Jordan’s lessons are largely catered to the student's needs and goals, yet she firmly believes that all of swimming should be enjoyable. She grew up on swim team, surfing and playing water polo, she is a full lover of all things water and her passion for it emanates in the lessons she teaches. While living in San Diego, she worked firsthand with individuals on the Autism spectrum and saw the benefits of which came from just simply being in water and began teaching lessons specific to those clients. Katia has taught swimming since 1992 and has worked with all ages and experience levels, including children with health issues to athletes who want to excel as swimmers. Having been a swimmer for 13 years, as well as an experienced coach, Katia understands the individual needs of each swimmer she works with. She thoroughly enjoys coaching and seeing her students' progress in breaking barriers and achieving new goals. Katia is also fluent in Russian and has worked overseas, in Russia and Israel. Katie grew up in the water, swimming competitively for 13 years. She has been teaching youth swim lessons at PRO Club since 1999. She was also an elementary school teacher in the Bellevue School District for eight years. Her passion for teaching and children, as well as her high expectations, lead to progress and success. Katie has a passion for water and loves the joy it brings to children who are learning to swim. She’s a patient teacher and morphs her lessons to fit each child’s personality and skill level. She’s energetic and focused when breaking down skill levels and enjoys brightening her student’s day. Katie teaches Mermaid camps during the summer for ages 3 to 12 years old. She’s PRO Club’s personal mermaid. She swam competitively for three years in high school and played water polo during off seasons. Kelsey has taught swimming lessons for over 20 years in Montana, Oregon, and Washington. Her background includes teaching baby, youth, and adult lessons, as well as coaching swim team, beginner synchronized swimming, and beginning diving. In teaching at many different pools over the years, Kelsey has gained a great combination of ideas and creativity that pushes her clients to achieve their goals, regardless of their age or any obstacles they may face. Kelsey is a fun and enthusiastic swim instructor who enjoys sharing her love of water with others. She began teaching swim lessons in 2007. Since then she has taught, baby aquatics, group lessons, private lessons, adults, water polo, synchronized swimming, and triathletes. Originally from Portland, Kelsey was a synchronized swimmer for nine years. She also played water polo for eight years and was the goalie for the University of Oregon’s water polo team. Kelsey is also a triathlete and competes in several triathlons, Ironman 70.3s, and Ironman races. She graduated from the University of Oregon with a degree in Education and minor in Special Education. Kirstin has been teaching swimming since 1998. She truly invests this in each swim lesson, taking personal pride in seeing the growth and success of her students. Her warm presence, caring heart and willingness to work with all children at any ability makes her exceptionally good with children with disabilities or special needs. She also has an extensive background and training in synchronized swimming and teaches H2O Cardio, Baby Aquatics and helps train our incoming instructors. Margie’s aquatic interests include synchronized swimming as a teen, water safety/swim instructor training as a young adult, and competitive swimming as a triathlete and Masters as an adult. Her passion for human movement led her to a career as a physical therapist. 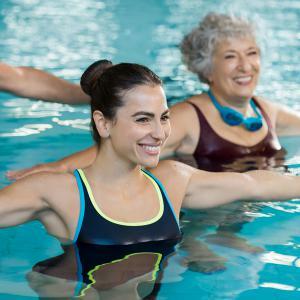 The 30 years she has spent refining and developing a keen understanding of human motion, muscle strength, and neuromuscular training is a perfect combination when teaching the dynamics of swimming to new swimmers. Matthew is very passionate about swimming and enjoys making sure each swimmer receives the best possible teaching experience. Having swam competitively for over 10 years, he is comfortable teaching older and competitive swimmers, but also loves interacting with younger children. Fluent in Mandarin Chinese and having experience working with children from 5 to 14 years, Matthew is excited to share his love of the water. Being Australian, Meryl grew up in and around water. She has been teaching for 25+ years and is passionate about showing everyone, young and not-so-young, how much enjoyment can be obtained from both swimming and exercising while wet. Her enthusiasm and creativity are apparent in every H20 cardio class she teaches. In her beginner adult swim classes, she teaches balance and being comfortable moving through the water before perfecting style. Omri believes swim lessons should be fun while focusing on technique and strength. Having been on swim team as well as having worked as a Taekwondo instructor, lifeguard, and kids sports camp director, he values the importance of regular practice. His aim is to have his students walk away from each swim lesson with a smile on their faces and with the goal of something to practice on their own. He speaks Hebrew fluently. Steve is a caring instructor with over 15 years of teaching experience. He teaches youth to adults and enjoys striving to connect with his clients. He is currently teaching 5th grade in Bellevue. Sydney started swimming competitively at six years old and continued to compete through her senior year in high school. She enjoys working with kids of all ages. Sydney is an energetic and fun instructor who enjoys watching her students learn to love swimming as much as she does. Victoria was a Division I collegiate swimmer for 4 years, where she earned multiple WAC All Conference Honors. She also worked in alongside multiple Student Health coalitions where she help create a healthier environment on campus for all students. She is both certified in ACSM Personal Training and CRP/First Aid. Her personal training philosophy is to help become functionally fit at any age. She believes that with the right training and education, there is nothing physically you cannot do in life. Trent has a strong passion for swimming that started at a young age. Having graduated from the PRO Club lesson program himself, he has a deep desire to see his students succeed, whether conquering their fear of water or engaging in swim team style practices and drills. Above all, Trent pays high attention to detail to help his students improve their technique and get them onto achieving their goals. Zach loves the water and is very passionate about teaching swimming and helping others learn the sport. He is a very patient instructor having taught ages ranging from 8 months to adults. Zach has over 10 years of competitive swimming experience and is currently a coach for the PRO Club Swim Team. While his main focus is on helping swimmers improve their technique at the upper level of swimming, he is also eager to teach the basics of swimming.